Since 2011, WOLA staff have carried out research in six different zones of the U.S.-Mexican border, meeting with U.S. law enforcement officials, human rights and humanitarian groups, and journalists, as well as with Mexican officials and representatives of civil society and migrant shelters in Mexico. As part of this ongoing work, the authors spent the week of November 26-30, 2012 in south Texas, looking at security and migration trends along this section of the U.S.-Mexico border. Specifically, we visited Laredo, McAllen, and Brownsville, Texas, and Matamoros, Mexico. We found that unlike other sections of the border, the south Texas sections have seen an increase, not a decrease, in apprehensions, particularly of non-Mexican migrants; migrant deaths have dramatically increased; and there are fewer accusations of Border Patrol abuse of migrants. We also found that the Zetas criminal organization’s control over the area may be slipping and drug trafficking appears to have increased, yet these U.S. border towns are safer than they have been in decades. 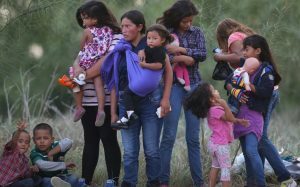 Lastly, in spite of the ongoing violence on the Mexican side of the border and the failure of the Mexican government to reform local and state police forces, U.S. authorities are increasing repatriating Mexicans through this region, often making migrants easy prey for the criminal groups that operate in these border cities. Bucking the migration trend: One of the biggest changes along the entire U.S.-Mexico border since the mid-2000s has been a sharp reduction in the number of migrants being apprehended by U.S. law enforcement (and thus, probably, a similarly sharp drop in migrants who are crossing the border). The area we visited, however — especially the southernmost region (the Border Patrol’s Rio Grande Valley Sector) — bucked this trend in 2012: it saw a sharp increase in the flow of migrants this year. While official 2012 numbers aren’t out yet, the Rio Grande Valley Sector experienced a 60 to 70 percent increase in apprehensions of migrants over 2011, to somewhere around 100,000. “Other than Mexicans”: Virtually all of this growth in migration, officials say, consists of “OTMs,” local authorities’ shorthand for “Other than Mexican” — chiefly, citizens of Honduras, Guatemala, and El Salvador. For the first time in any U.S-Mexico border sector, non-Mexicans made up the majority of this year’s annual total of apprehended migrants in the Rio Grande Valley. The security crisis of Central America’s “Northern Triangle” countries, along with ongoing poverty and lack of employment opportunities, were the reasons most frequently cited by the officials and experts with whom we spoke. It is remarkable that Central Americans are increasingly traveling through this vector instead of trying to cross elsewhere; though it is the shortest distance from Central America, the Mexican state of Tamaulipas is notorious for the frequency and brutality of violence that criminal groups commit against migrants, including the August 2010 massacre of 72 migrants, mostly Central American, in San Fernando, Tamaulipas, just 100 miles from the U.S. border. 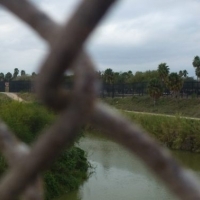 Migrant deaths are way up in south Texas: Despite the danger on the Mexican side, the Tamaulipas-Texas border still appears to be attractive to migrants. 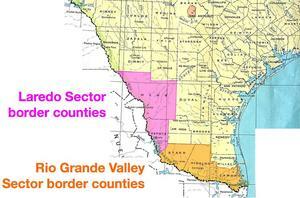 Currently the Rio Grande Valley sector has 52 miles of fence along 317 miles of riverfront border, and the crossing is increasingly deadly. Some migrants drown in their attempt to cross the swift river. An even larger number are dying of dehydration and exposure in the dry scrublands north of the border towns. Once past the border, migrants seek to continue northward — toward Houston, Dallas, and further on — where employment opportunities are greater. The bodies of about 127 migrants were recovered in 2012 in Brooks County (an hour north of the border) alone, nearly double the grim 2011 number and similar to the 150-200 annual deaths normally recorded in Arizona, where the tragedy gets more attention. The Zetas’ control is strong, but perhaps slipping: On the U.S. side, when we asked residents when they had last crossed into their sister towns in Mexico, the answer was invariably “years.” Very few visitors go to Nuevo Laredo, Reynosa, or Matamoros; in fact, a large number of wealthy and upper-middle-class residents of those towns has moved across the border into the U.S. towns, taking their businesses (including prominent shops and restaurants) with them. Nuevo Laredo had seen a spike in drug-related violence in 2005 when the Zetas, who were then acting as the enforcer arm of the Gulf cartel, battled with the Sinaloa cartel for control over the area. The Zetas’ split with their former bosses in the Gulf cartel caused violence to rise again, reaching horrific levels in Nuevo Laredo and other border cities in 2010. The bloodshed remained frequent after that, as the Zetas went well beyond drugs to include control over networks of extortion, migrant smuggling (we were told that smugglers must pay whoever controls the border area a toll of about US$500 per migrant), kidnapping, and other highly predatory activity. The population of these cities has been hit very hard; waves of violence, including shootouts in broad daylight in the center of town, have claimed many innocent lives following the takedowns of top Zetas leaders or internal disputes. This was the first border region where we were warned beforehand that it was inadvisable to cross the border. This was for our own security but also for that of the non-governmental leaders, like migrant shelter personnel, with whom we’d be seen. However, directors of migrant shelters in all three cities said that things had cooled a bit in recent months, and thus it was safe to pay short visits, which we did in Matamoros. The October killing of Zetas boss Heriberto Lazcano and apparent ascent of Miguel Treviño (“Z–40”) have not increased violence in Reynosa and Matamoros, apparently, though overall levels remain extremely high. We heard, though, that violence is worse lately in Nuevo Laredo and further west in Coahuila state. U.S. law enforcement officials coincided in their estimation that the Zetas’ grip over this region was slipping a bit, both due to the group’s own divisions and possible inroads from the larger Sinaloa cartel. They saw an increase in drug seizures as evidence of looser control, an indication that different groups were seeking to slip drugs into the United States through routes that had previously been locked down. This is an ominous bit of news; if a vacuum of organized crime control has opened up, violence may flare up again in Northeastern Mexico. These vacuums are rarely filled peacefully. Despite the region’s security crisis, the U.S. government continues to deport apprehended migrants to these Mexican border cities in large numbers. Mexican migration authorities have counted more than 58,000 deportees arriving in Matamoros alone in 2012. In this city, agents of the Grupo Beta — Mexico’s National Migration Institute’s search and rescue unit — told us that rather than rescuing migrants in distress, their main task is now protecting repatriated migrants. In addition to Mexicans detained in the interior of the United States and deported by Immigration and Customs Enforcement (ICE), the relatively new U.S. Customs and Border Protection’s Alien Transfer Exit Program (ATEP) deports some detained migrants “laterally” by sending them to Mexican border towns hundreds of miles from where they were captured in order to break the link between the migrant and his smuggler. Most migrants apprehended in south Texas who end up being deported through ATEP get sent on a near-daily flight 1,000 miles westward to Calexico, California, from which they are sent into the relatively low-crime city of Mexicali, Baja California. 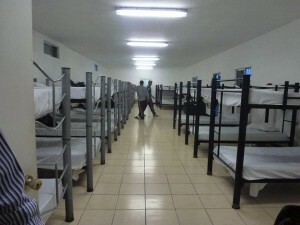 However, a smaller but very troubling number of ATEP migrants are still detained elsewhere and deported into Matamoros. As they arrive in this unfamiliar city, these deportees face a high probability of being preyed upon — or even recruited — by the criminals who control illegal activity. That U.S. authorities would be moving migrants from elsewhere along the border and deporting them into high-risk Matamoros is inexplicable. In fact, a review of data from Mexican security and migration authorities reveals a troubling trend: as border zones become less secure, they receive more deportees. 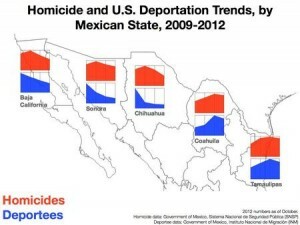 In every Mexican border state that saw an increase in homicides since 2009, deportations from the United States also increased. 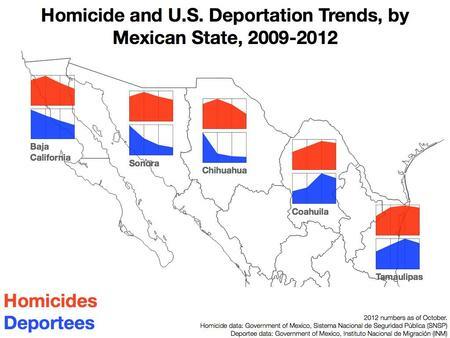 In Mexican states where homicides declined, deportations also declined. These data don’t indicate something as nefarious as U.S. migration authorities deliberately placing deportees in harm’s way. And we understand that there are many factors that influence the number of deportations per sector, such as the number of ICE removals, ATEP, and apprehensions of migrants by the Border Patrol in each sector. However, the numbers do indicate that U.S. migration authorities either aren’t taking security risks into account when they deport people, or if they are, that they are not even close to keeping up to date on Mexico’s shifting patterns of violence. Mexico’s state and local level security forces remain profoundly unreformed: Not long after the government of former Mexican President Felipe Calderón deployed the military to this territory to take on the cartels, the municipal police forces of Nuevo Laredo, Reynosa, and Matamoros were all but disbanded. These police were seen as incorrigibly controlled by organized crime, and we universally heard similar complaints about the Tamaulipas state police who continue to patrol these cities. Distrust of these police is very high. Mexico’s Federal Police, meanwhile, do not yet have a strong presence in this zone. Of all security forces, the Mexican armed forces (Army and Marines) are the least distrusted. Regardless of political leanings, Mexicans in this zone support the military presence in their border towns due to an utter lack of other options. While they certainly don’t back the military unconditionally, they view them as far more likely to protect them. It is the military that confronts the criminal groups in these cities, with shootouts and blockades (bloqueos, in which criminals hijack a large vehicle and park it across a busy road to impede military pursuers) a frequent occurrence. In Matamoros, we had to drive around a bus that had been parked across an intersection hours earlier. When we asked U.S. law enforcement officials which Mexican security forces they interacted with most frequently, they uniformly cited the military or the federal Attorney General’s office (Procuraduría General de la República, PGR). Drug trafficking has generally increased: Laredo, where Interstate 35 begins its route to Dallas and up to Minneapolis, is the United States’ busiest land port, with about 7,000 trucks per day crossing into and out of Mexico. This much commercial traffic also means a lot of drug trafficking, a big reason why the Nuevo Laredo plaza is fought over so intensely. Continuing a trend that goes back at least to 2005, U.S. law enforcement continues to increase the amount of drugs it seizes in the Laredo and Rio Grande Valley sectors, though there is some variation by type of drug. The increases mean that agents are getting better at stopping drugs, but they also tell us that the big buildup of U.S. border security measures is not deterring traffickers. Heroin seizures, we were told, are up dramatically in the Laredo sector. Authorities have also begun to encounter large quantities of something new: liquid methamphetamine. In the Rio Grande Valley sector, seizures of marijuana are up from about 400,000 pounds in 2008 to over 1 million pounds in 2011. Drugs like heroin, meth, cocaine, and synthetics, for which even small quantities fetch sky-high profits, are principally trafficked through official border crossings. Marijuana, which is much bulkier, is more frequently smuggled across the Rio Grande in rural areas. There is no “spillover” violence: More drugs have not meant more violence on the U.S. side of the border. The broad consensus among all we interviewed — police chiefs, federal law-enforcement officials, journalists, activists, and the helpful staff of the Laredo Convention and Visitors’ Bureau (creators of the www.laredoissafe.com campaign) — all agreed that the towns on the U.S. side are safer than they have been in decades. Crime statistics bear this out: murder and most other violent crime rates are lower in Laredo, McAllen, and Brownsville than in Texas’s principal cities. Residents voiced annoyance with politicians in Austin and Washington, including members of Congress from non-border districts, who portray their towns as a “war zone” in order, in their view, to pursue anti-immigration agendas. They contend that their words discourage tourism and hurt business. There have been a few incidents of what could be called “border violence” or “spillover violence”: a handful of murders that could be gangland hits, and some “safe houses” hiding dozens of northward-bound migrants, who in some cases may be unable to leave until relatives send extortion payments. The main crime concern in these U.S. border cities is an increase in kidnappings and home invasions; these, however, appear to be the work of U.S.-based, not Mexican, perpetrators. In rural areas, ranchers say that they feel menaced by drug or migrant traffickers crossing their lands, but incidents have been exceedingly infrequent; a more immediate concern is the increasing number of bodies of migrants, dead of dehydration and exposure, appearing on ranchlands. Allegations of abuse are less frequent here than in Arizona and California: Relations between Border Patrol and the local community — including rights advocates and humanitarian groups — were much less confrontational in these sectors than we had seen in Arizona and California. Allegations of migrants abused in detention (assaulted, denied food and water, held in stress positions, having belongings stolen) were much less frequent, though advocates said that these remained a concern. In the Rio Grande Valley sector, Border Patrol even leaves water at the rescue beacons in rural migrant corridors in an effort to reduce dehydration deaths, a practice that Border Patrol’s Tucson, Arizona sector discourages, despite the fact that simple measures like this one could save lives. Most complaints of abuse or improper use of force were leveled not at Border Patrol but at the Texas DPS, which carries out its own border operations and, in late October, fired on a truckload of migrants from a helicopter near McAllen, killing two Guatemalan citizens. Some interviewees expressed strong dismay about a September incident in which a Border Patrol agent in a boat allegedly responded to rock-throwers by firing on a picnicking family on the Mexico side of the Rio Grande, killing the father. In recent memory, they said, they had not faced such use-of-force issues with Border Patrol in their sector. Adam Isacson is Senior Associate for Regional Security Policy and Maureen Meyer is Senior Associate for Mexico and Central America. Next PostNew UN global initiative wants everyone to answer: What kind of World do you want?